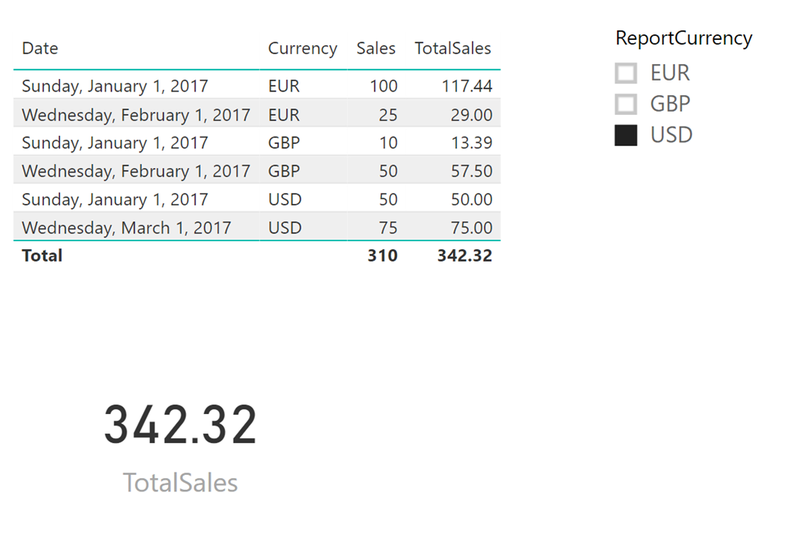 Another interesting question that came up recently is how to do currency conversion in Power BI. My colleague Jeffrey Wang had a very neat solution that I want to share more broadly. The ReportCurrency table will be used to create the slicer in the report that allows us to select the currency. The other 2 tables will allow us to get the correct Exchange rate for the each sales transaction using date and currency. This means that for each row in the factsales tables we filter down to 3 rows in the FactExchangerate table based on the date and currency relationship. 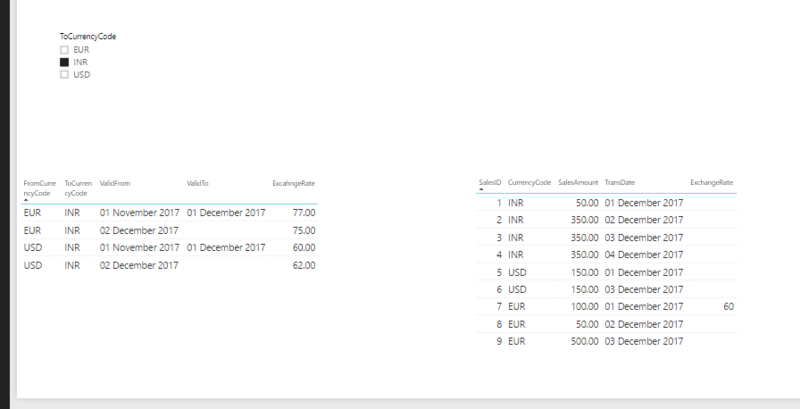 Now based on the ReportCurrency slicer we filter it down to a single row thus leaving us with the Exchange rate we need. The problem here of course is that we need to do this on the fly because for each day we might have transactions using multiple currencies so we need to take that into account. This will get the lowest factor value from the fact table. This DAX expression will summarize (SUMX) each row in the FactSales table (that is in the current selection) . For each row it will use the value from the sales column times the Exchange rate returned from the TrnExchangeRate measure. The SUMX is key to get the right numbers, it will iterate over the rows in the fact table dynamically and summarize the results into a single number (currency). Again this is key as each row might be a different currency on a different date and the relationships will make sure only a single value will get returned from the FactExchangeRate. 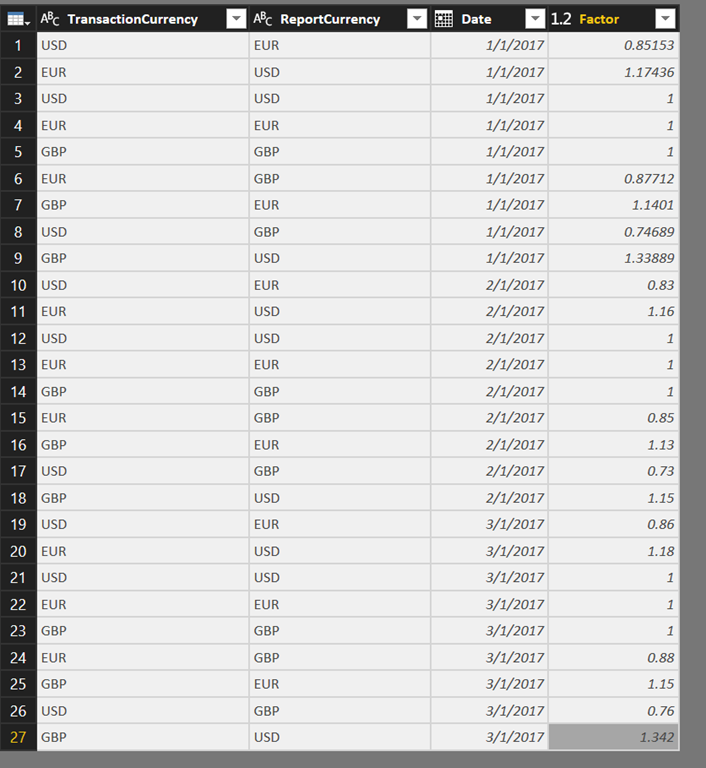 As you can see the 100 Euro’s get translated to 117.44 USD where the USD amounts stay the same. So a clever combination of the model and some DAX will get you currency conversion. Also the grand total is showing the one USD sales number. Unfortunately there is dynamic formatting yet in Power BI to apply the format on the fly as well. or it will have performance issues? That will give you a direct many to many which isn’t supported, you need to go through intermediate tables. The measure will probably work but I always would recommend splitting them up for debug and cleanliness sake :). I am so glad variables and calculated tables have come along. I like the additional twist you put on this while maintaining leaf level calculations. I wonder how would one configure the data model if, the factSales table would have a date range where the sales were valid ( lets say 2 fields [dateFROM] and [dateTO] ), and the convertion rate table also with 2 columns of the same type. I would tweak the sumX to iterate on the distinct combination of sales date and transaction currency only rowstime and not per each sales fact row. It will perforn way better – need just to use sumx over summarize function. FromCurrency, ToCurrency, ExchangeRate, ValidFrom and ValidTo. So can we write DAX to get ExchangeRate dynamically for each FactSales record. I really like how you explained this in a simple yet effective manner. But being a newbie, I still struggle translating this into my case, which is very similar. The difference is the user selects the CurrencyDate (instead of the target currency), and the target currency is always USD. 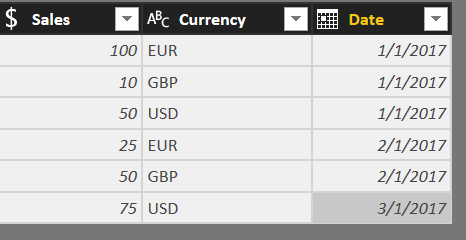 I created intermediate tables and relationships linking the fact and rate tables similar to yours, but CurrencyDate is the calculated table used as the slicer. I’m not sure where to put the restriction on USD and I get empty values for the AmountUSDAtDate calculated measure. Could you please help me understand why?